LinkedIn Marketing Solutions head of product Russell Glass spoke with Lauren Johnson of SocialTimes parent Adweek, saying that brands on LinkedIn can determine how many users took actions such as purchasing products or signing up for services after viewing ads or sponsored content on the professional network with the addition of tag coding to their websites. 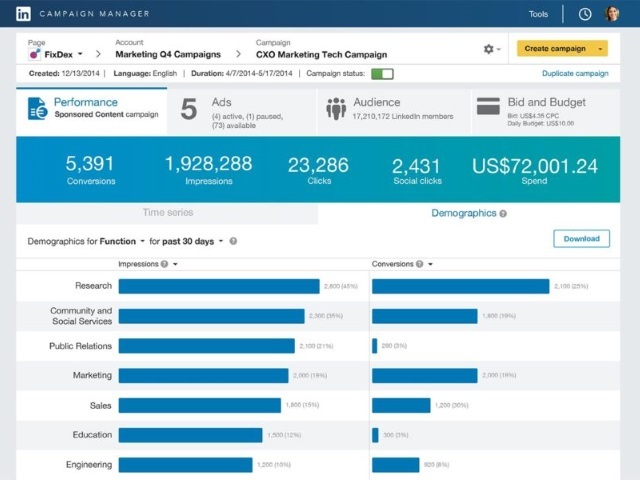 Glass told Johnson brands on LinkedIn will be able to track sales leads, sign-ups, downloads and sales, adding that conversion tracking is available via LinkedIn’s ad management software, as well as via LinkedIn Certified Marketing Partners 4C and AdStage. (The goal is to) get below the clicks and engagement metrics and beyond to the conversion metrics that are happening on a marketer’s own website. You can see that, let’s say, the finance industry is converting at a much higher rate than the healthcare industry. You can see that people with marketing job titles are converting at a much higher rate than people with sales (titles). Readers: What are your thoughts on LinkedIn’s introduction of conversion tracking?